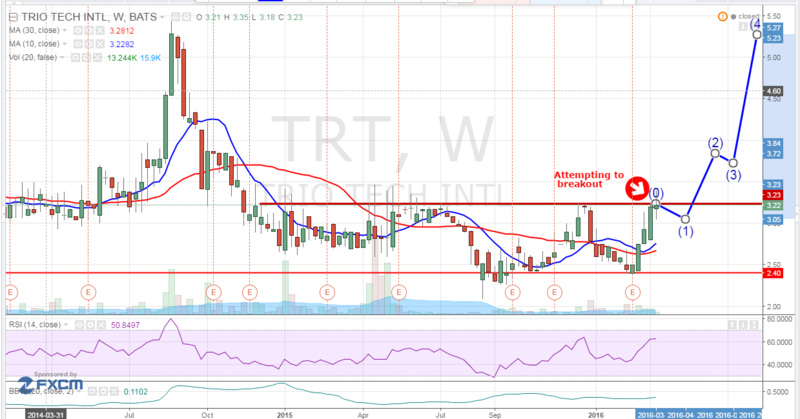 Trio-Tech International (NYSEMKT:TRT) has made a powerful move off a double bottom rising over 34% in less than a month. TRT has more gains in store based of its most recent developments and the company is poised to grow its bottom line. Trio-Tech International (NYSEMKT:TRT) is well below its glory days when the stock was trading at over $23 per share versus its current price of only $3.22. The stock advanced almost 3% on Friday on light volume. The rally in TRT has been quiet with limited shares trading hands which means this stock is flying under the radar. There are only 3.51 million shares outstanding which means that this is a low float stock that could skyrocket at any moment leaving would be investors in the dust wishing they had pulled the trigger. The company recently released its first half fiscal year performance. Earnings per share skyrocketed 1,400% from a loss of $0.01 share in 2015 first half to $0.13 for 2016 first half. Operating income doubled to $0.627 million in first half of 2016 from $0.314 million in first half of 2015. Cash grew over 17% from first half 2015 to first half 2016. TRT has over $4.37 million cash or $1.24 cash per share. Close to 40% of the stock price is equivalent to its cash value. TRT is potentially becoming a cash generating machine. The company is trading significantly lower than a price to sales ratio of 1 which could indicate the company is undervalued. Trio-Tech International (Trio-Tech) is engaged in providing third-party semiconductor testing and burn-in services primarily through its laboratories in Asia. The Company operates in four segments: Manufacturing, which manufactures both front-end and back-end semiconductor test equipment and related peripherals, which performs structural and electronic tests of semiconductor devices; Distribution, which is engaged in the distribution of various products from other manufacturers in Singapore and Southeast Asia, and Real Estate, which is engaged in the real estate property in China. TRT is currently trading at a $11.64 million market valuation. The company is showing signs of turning around and has proven itself able to control expenses and grow profitability despite declining revenues. It has a strong cash position, a price to sales ratio significantly less than competitors, and is posting improving profitability. TRT could be set for huge gains. Stay tuned for new updates and developments. We will be updating on TRT when more details emerge so make sure you are subscribed to Microcapspot so you know what’s going on with TRT. Disclosure: we hold no position in TRT either long or short at the publication of this article and we have not been compensated for this article.